My first guerrilla gardening mission was a success from several perspectives. First of all, I met some neighbours from the hood, and I had a lot of positive feedback from passersby on my street. We planted in the middle of May (after the last frost), and I kept up the pruning, watering and picking up of litter until the end of September. Initially, my red geraniums against the blue wall were spectacular, particularly from the park and daycare centre across the street. Our site was an oasis in a sea of cement if you will, a welcome addition to the backdrop of the four ugly brothers (four cement, graffiti-riddled, rundown, industrial high-rises). The brothers are responsible for a number of ills on our street. Not only do their workers park here and empty their garbage and ashtrays into the CN field and onto the sidewalks, these eyesores create horrendous wind tunnels that blow the trash far and wide. But I digress. Choose a site that is close to home and near a source of water. Remember, water is heavy, so the closer to home the better. You will also want to choose a spot that everyone can see. If the soil is sandy, it will not retain water, and you may need to add some top soil. Choose your plants according to these conditions, and remember some shade means less watering. Best times to water, early morning and evening. Although my bright red geraniums were the highlight of my site, they were a bit too showy and attracted the wrong crowd. Nine of the dozen I paid $65 for were stolen five days after they were planted. One of the neighbours who read my guerrilla gardening article in the Montreal Gazette was so incensed by the theft that she added three red pepper plants. I added some marigolds from the borough flower give-away to fill up the empty space. Was I steamed? Yes, indeed. But remember, you can't let one killjoy ruin your fun. In addition, the more you go and work on your site over the summer, the more presence you create. Neighbours will see what you're doing and keep an eye on your site. Remember one holler from a balcony will ward off vandals and thieves. My first mission was with a seasoned guerrilla gardener who lived extensively on the Left Coast before moving back to Montreal. She had some good gardening tips, and you will definitely need a few pairs of hands to carry all the gear. My five-year-old daughter also helped out. You will definitely need gloves for clearing the area. Unfortunately, as is the case in any city, you will find used seringues. I found one this summer, and my daughter found the other. Yes, yikes! We were lucky, no injuries. You will find the usual Tim Horton's coffee cups and lids, an array of fast food wrappers, cigarette butts, broken bottles, paper and plastic. We dug up layers of garbage, and initially, I found it disgusting, but then I got over it. Litter gives you a good idea of who actually passes through the neighbourhood and who is responsible for the mess. Don't forget to bring along a garbage bag. Anyway, the clearing takes the longest, and you should be prepared to bend over for a long period of time. The planting takes just a few minutes. By the time, we got our planting done, neighbours from the condos across the street were over to have a look. This was a stroke of luck because they were so pleased with our work that they let us use their water for the entire summer. This meant that I did not have to lug water up the street. As I found out pretty early in the season, birds love seeds, particularly wild flower seeds. We planted a lot of wild flowers, and our results were less than satisfying. I planted cosmos from seed in mid-June, and they were successful. I have read that having the seeds germinate in your home before planting them produces the best results. You may also want to ask someone who works in a nursery to join your guerrilla gardening squad. Damaged plants are another option. I know of a Point St Charles group that got a number of damaged flowers from the Atwater market for their site. As I am not a Quebec native, I was afraid of getting into trouble for trespassing. This is the reason that most guerrilla gardeners do their planting at night. A cop did in fact drive by when we were planting, but he was more interested in what was going on in the park across the street. He didn't even slow down. 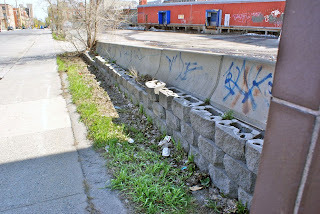 The reason may be that the borough issued a newsletter last spring indicating that residents were responsible for taking care of the small plots of earth (and usually weeds) along the sidewalks. It seems that our fair city is trying to get residents to assume responsibility (and the costs) for urban beautification. That said, it's no surprise the cop didn't stop. The property where we were planting belongs to Presto, a wholesale food supplier. One of my neighbours went in to talk to the manager about our covert guerrilla gardening operation and whether his company would be willing to continue the clean-up. The manager was apparently pleased that someone had actually painted over the graffiti on the wall, picked up the trash and planted flowers. However, he had no more funds for further beautification. Apparently, the company had already spent $15,000 that year to clean off graffiti. I'm kicking myself for not taking enough pictures. There were times this summer when I was really proud of how beautiful our site looked. Our marigolds and yellow daisies seemed to enjoy their home, and the red peppers gave us a little splash of red. One geranium made it all the way to early September. 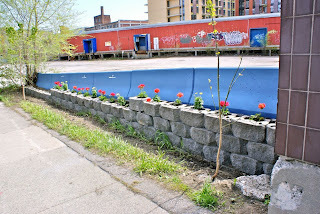 : Guerrilla Gardening: Tips for the NoviceTweet this! Great effort at changing the face of your street. Graffiti can be beautiful too. You're absolutely right, it can be, but unfortunately, it can also be a sign that no one cares what goes on in the neighbourhood. As you will see in some of my more recent posts, graffiti is a sign that anything goes.